Getting fitter and healthier in 90 days...with data! So I thought I’d talk about something non-techy and more personal. Like a lot of people in tech, I wasn’t exactly the pinnacle of health. It’s a job culture that involves a lot of sitting on a laptop, late-nights, coffee, sweets, meals out and pizza. So I’ve been trying to improve my health and generally lose some fat, gain some muscle since about 2012. Started out just kinda blindly doing whatever, bit of running, a bit of gym, changing diet a bit. I got a little bit fitter but it wasn’t very consistent. Eventually, I met up with some old friends who I knew about powerlifting and Olympic lifting. So I started doing that, and I started doing the big 4 (Deadlift, OHP, Squats and Bench). I started to get fairly strong, but I wasn’t getting healthier. I noticed muscles but there was still a layer of fat on top. At my peak I was squatting around 150kg, Deadlifting around 170 and Benching around 110kg. All pretty good numbers for a year or so of training, however, proportional to my weight, they were pretty bad (weighing around 90-100kg). Eventually, I realised that it was great being strong, but I also wanted to actually get healthy. Lower resting HR, slimmer and such. Plus a bit of vanity of wanting to get abs for summer! So I started to actually watch my diet, I bought a Fitbit scale to automatically measure my weight and tried to expand my fitness regime to a bit more cardio, not just weightlifting. So I was down from a max of 96kg, down to about 83kg or so. About 13kg (Around 28lb for Americans reading this!). But when I started getting to the 81-82 mark, I started to plateau. 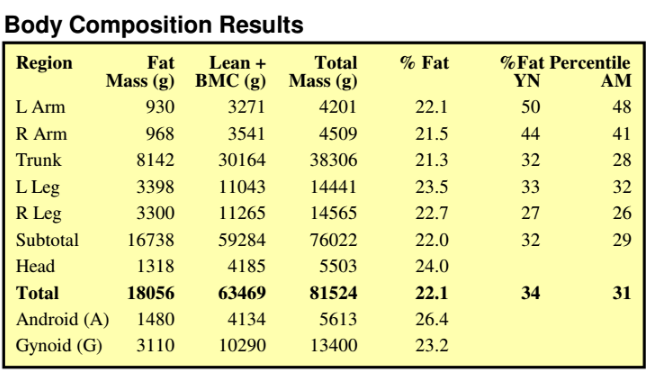 I already knew that home scale BF% was pretty inaccurate, but it would wildly dip and spike, leading to an unhealthy obsession with weighing myself constantly. I was also doing a fairly travel intensive work project so it was hard to get the diet and exercise that I wanted. I kinda just floundered, I was still making progress but not exactly what I wanted. Eventually, I had the idea to book a DEXA scan, to get a more accurate look at how much fat I had and what I needed to do. So, 22% BF, pretty far of the Fitbit scale of 16% body-fat! Funny thing was, the person doing the scan said that I was actually in the minority that I hadn’t “Skipped leg day”. In fact, my legs are way ahead of my arms muscle percentage-wise. Means I need to incorporate more upper body workouts! Need to really focus on one area: choose to work on gaining muscle or losing fat. It’s possible to do both, but generally not without a super efficient training program, a lot of previous experience… or PED’s! Stop focusing on the number on the scale, as it’s not super accurate. It’s only useful as a general barometer every week or two weeks, not every day. So armed with this information, I setup another DEXA scan in 90 days time so I can see my progress and see if everything is according to plan. 90 days seems to be the sweet spot for measuring progress, it’s long enough that you can see significant change, but not so long that you’ve doomed yourself if you’ve been doing things wrong and you lose progress.